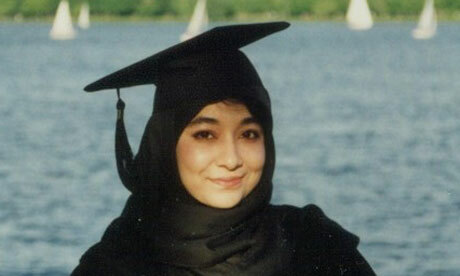 Aafia Siddiqui, the Pakistani neuroscientist whose case has become a flashpoint of Pakistani-American tensions, plotted to smuggle explosives into America and offered to manufacture biological weapons, according to the Guantánamo files. The allegations are a combination of US intelligence analysis and direct testimony by at least three senior al-Qaida figures, including the 9/11 plotter Khalid Sheikh Muhammad. They cannot be independently corroborated and the testimonies were likely to have been extracted under conditions of torture. Muhammad, known as KSM in intelligence circles, was waterboarded 183 times in the month after his capture in Pakistan in March 2003. But several of the accounts do overlap, linking Siddiqui, a diminutive 39-year-old mother of three, with some of Osama bin Laden's most senior lieutenants. They help explain why the FBI placed her on a list of the world's seven most wanted al-Qaida fugitives in 2004. Siddiqui disappeared from Karachi in March 2003 only to reappear five years later amid murky circumstances in Ghazni, central Afghanistan. There was an altercation in a police station and the US accused Siddiqui of trying to shoot two soldiers and two FBI agents. She was sent to the US, tried and last year sentenced to 86 years' jail. At home in Pakistan she became a cause célèbre widely viewed as an innocent victim of American injustice. During the recent stand-off over Raymond Davis, the CIA spy who shot two people in Lahore, a chorus of Pakistani politicians demanded the US repatriate Siddiqui in exchange for the American. The Guántanamo files offer a murky perspective, placing Siddiqui at the heart of an al-Qaida cell based in Karachi between 2002 and 2003. Emboldened by the success of the 9/11 attacks and led by KSM, the cell conspired to mount fresh attacks in the US, on Heathrow airport and inside Pakistan. According to the files, the cell planned to smuggle explosives into America under the cover of textile exports – 20 and 40ft foot containers filled with women's and children's clothes. The explosives would be used to attack "economic targets" inside the US, according to KSM. The operation would take place through an import-export business run by Saifullah Paracha, a Pakistani businessman who worked as a New York travel agent for 13 years before developing ties to Osama bin Laden. Paracha, 64, is currently in Guantánamo Bay. According to Paracha's file, Siddiqui's role was to "rent houses and provide administrative support for the operation". As part of this brief she travelled from Pakistan to the US in January 2003 to help renew the American travel papers of Majid Khan, a co-conspirator who had been ordered to bomb petrol stations and water treatment facilities in America. According to Khan, he provided Siddiqui with money, photos and a completed application for an "asylum travel form" that "looked and functioned like a passport". Then, according to Khan's file, "Siddiqui returned to the US and opened a post office box in detainee's name, using her driver's licence information". The plot collapsed after Khan was picked up in Pakistan and sent to Guantánamo. A co-conspirator in America, Uzair Paracha, was arrested in possession of the post box key. Paracha, son of Saifullah Paracha, was sentenced to 30 years' imprisonment in 2006; details of Siddiqui's role in the plot surfaced during his trial. Siddiqui's family have always insisted she was framed. Her lawyer, Elaine Sharpe, suggested she had been the victim of identity theft; her sister Fowzia said the purpose of the postbox was to apply for jobs at American universities. The Guantánamo files give fresh details on Siddiqui's relationship withAmmar Baluchi, the nephew of KSM and a senior al-Qaida figure facing a raft of serious allegations – facilitating the 9/11 attackers, acting as a courier for Bin Laden and plotting to crash a plane packed with explosives into the US consulate in Karachi. Siddiqui reportedly married Baluchi during a secret ceremony near Karachi in February 2003, six months after divorcing her previous husband who said he had grown alarmed by her extremist views. Siddiqui's family denies the marriage took place. Baluchi said he told Siddiqui, who has a biology degree from MIT, that al-Qaida had set up a laboratory to make biological weapons. Siddiqui replied that she "was willing to participate in a biological weapons (BW) project if al-Qaida tasked her to do so". After that conversation, Baluchi said, "he never tasked Siddiqui to participate in the BW project and never considered to let her work in the laboratory". Al-Qaida has a biological weapons programme based in Afghanistan stretching back to the late 1990s. When Siddiqui was arrested in Ghazi in 2008 her handbag contained several bottles of deadly chemicals, extracts from an "arsonist's handbook" and details of several prominent American landmarks. According to Balochi's file, he told interrogators that he became aware of a plan to attack Heathrow airport in January 2003 and had intended to seek help from a more senior al-Qaida operative, Walid bin Attash, to carry it out. An "analyst note" in the files notes that the plot called for "crashing numerous airplanes into Heathrow, with a secondary explosion immediately outside of the airport as a diversion". It collapsed after KSM was arrested in March 2003. Despite the serious nature of the allegations against Siddiqui contained in the Guantánamo files, the US has never attempted to prosecute her for them. In last year's court case she was charged with attempted murder; afterwards her lawyer said the case had been decided on "fear not facts". The Obama administration had planned to bring Baluchi and his uncle KSM to New York to stand trial for their their part in the 9/11 attacks. But the plan was dropped following fierce criticism from US politicians. The fastest way to change society is to mobilize the women of the world. Let's work together to achieve this goal.